I am kin to Kaiser Wilhem who married Hermine Reuss. Below are castles owned by the Reuss family. The name Reuss means “Russians”. Trump, of German extraction, knows Putin wants to bring back the Russian Monarchy. Kaiser Wilhelm was in Czar Nicholas’ cousin. They share similar DNA. They and their grandmother, are in my family tree, that usurpers tried to snip. I gave my friend, Amy, a lesson on how DNA carries TRUTH. History keeps repeating itself because the royals mix their genetic truths together. This is why a prophet born into a royal tree, can predict their moves. John the Baptist was of two priestly line, and Jesus of two Davidic lines. It is like owning psychic powers. It is more like own – The Truth! The Rapture Usurpers put Trump and Putin together – years before he ran. Demand to see the Mueller Report so We the People can follow the bouncing ball. It is never over for these greedy billionaires. DNA produces wealth. Wilhem expected Hitler to put him and Hermine Reuss on the restored throne, and was shocked that he did not. The relationship between Nicholas and Wilhelm, two grandsons of Britain’s Queen Victoria, had long been a rocky one. Though Wilhelm described himself as Victoria’s favorite grandson, the great queen in turn warned Nicholas to be careful of Wilhelm’s “mischievous and unstraight-forward proceedings.” Victoria did not invite the kaiser, who she described to her prime minister as “a hot-headed, conceited, and wrong-headed young man,” to her Diamond Jubilee celebration in 1897, nor her 80th birthday two years later. Czar Nicholas himself commented in 1902 after a meeting with Wilhelm: “He’s raving mad!” Now, however, the two cousins stood at the center of the crisis that would soon escalate into the First World War. The Reuss territories in the 18th century. Reuss at Gera, descendants of Henry XVI the Younger. While the Middle Reuss became extinct in 1616, the Older and Younger lines were divided again several times until in 1778 Count Henry XI united the possessions of Upper and Lower Greiz to the Principality of Reuss Elder Line. In return the remaining estates of Gera, considerably larger though, became the Principality of Reuss Younger Line in 1806. The two remaining Reuss principalities went on to join in turn the German Confederation (in 1815). Henry XXII of Reuss Elder line is notable among the more modern princes of this house for his enmity to Prussia, which he opposed in the Austro-Prussian War of 1866, when the Prussian troops occupied his domain. Henry joined the North German Confederation and the new German Empire (1871). He alone of all the confederate princes remained until his death (1902) an implacable enemy of Prince Bismarck and of the conditions created in Germany by the foundation of the empire. His daughter Hermine Reuss of Greiz however became the second wife of the exiled Kaiser Wilhelm II later. His son, Heinrich XXIV, Prince Reuss of Greiz (1878–1927), being incapable of ruling, the regency passed to the ruling prince of the younger line of Reuss. Both lines lost their thrones in German Revolution of 1918–19. Of both lines, only the Köstritz side branch of the Younger Line still exists today; their main seat is Ernstbrunn Castle in Austria, although the family regained some properties in the former Reuss states following German Reunification in 1990. After World War I, the Reuss territories were unified in 1919 as the People’s State of Reuss, which was incorporated into the new state of Thuringia in 1920. Princess Hermine Reuss of Greiz (German: Hermine, Prinzessin Reuß zu Greiz; 17 December 1887 – 7 August 1947), widowed Princess of Schönaich-Carolath, was the second wife of Wilhelm II (1859–1941). They were married in 1922, four years after he had abdicated as German Emperor and King of Prussia. Princess Hermine was born in Greiz as the fifth child and fourth daughter of Heinrich XXII, Prince Reuss of Greiz (28 March 1846 – 19 April 1902), and Princess Ida Mathilde Adelheid of Schaumburg-Lippe (28 July 1852 – 28 September 1891), daughter of Adolf I, Prince of Schaumburg-Lippe. Her father was the ruler of the Principality of Reuss-Greiz, a state of the German Empire, in what is present-day Thuringia. Princess Hermine’s disabled elder brother became Heinrich XXIV, Prince Reuss of Greiz in 1902. Upon her mother’s early death, she was raised at the court of Princess Louise of Prussia, daughter of Emperor Wilhelm I, and her husband Grand Duke Frederick I of Baden. Like Hermine’s father, Princess Louise was an implacable enemy of Prince Bismarck. Princess Hermine was married on 7 January 1907 in Greiz to Prince Johann George Ludwig Ferdinand August of Schönaich-Carolath (11 September 1873 – 7 April 1920). Prince Hans Georg Heinrich Ludwig Friedrich Hermann Ferdinand of Schönaich-Carolath (3 November 1907 – 9 August 1943), married Baroness Sibylle von Zedlitz und Leipe, killed in action at the Eastern Front during the Second World War. Prince Georg Wilhelm of Schönaich-Carolath (16 March 1909 – 1 November 1927), died unmarried. Princess Hermine Caroline Wanda Ida Luise Feodora Viktoria Auguste of Schönaich-Carolath (9 May 1910 – 30 May 1959), married Hugo Herbert Hartung. Prince Ferdinand Johann Georg Hermann Heinrich Ludwig Wilhelm Friedrich August of Schönaich-Carolath (5 April 1913 – 17 October 1973), married Rose Rauch, then Baroness Margret von Seckendorff. Princess Henriette Hermine Wanda Ida Luise of Schönaich-Carolath (25 November 1918 – 16 March 1972), married Wilhelm II’s grandson Prince Karl Franz of Prussia (son of Prince Joachim of Prussia) in 1940 and had issue. In January 1922, a son of Princess Hermine sent birthday wishes to the exiled German Emperor Wilhelm II, who then invited the boy and his mother to Huis Doorn. Wilhelm found Hermine very attractive, and greatly enjoyed her company. The two had much in common, both being recently widowed: Hermine just over a year and a half before, and Wilhelm only nine months prior. By early 1922, Wilhelm was determined to marry Hermine. 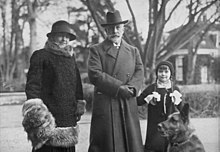 Despite grumblings from Wilhelm’s monarchist supporters and the objections of his children, 63-year-old Wilhelm and 34-year-old Hermine married on 5 November 1922 in Doorn. By all accounts, it was a happy marriage. Hermine’s first husband had also been older than she was, by fourteen years. Wilhelm and Hermine were 5th cousins through common descent from George II of Great Britain. In 1927, Hermine wrote An Empress in Exile: My Days in Doorn, an account of her life up to that time. She cared for the property management of Huis Doorn and by establishing her own relief organization, she stayed in contact with monarchist and nationalist circles in the Weimar Republic. Hermine also shared her husband’s antisemitism. She remained a constant companion to the aging emperor until his death in 1941. They had no children. Following the death of Wilhelm, Hermine returned to Germany to live on her first husband’s estate in Saabor, Lower Silesia. During the Vistula–Oder Offensive of early 1945, she fled from the advancing Red Army to her sister’s estate in Rossla, Thuringia. After the end of the Second World War, she was held under house arrest at Frankfurt on the Oder in the Soviet occupation zone, and later imprisoned in the Paulinenhof Internment Camp. On 7 August 1947, aged only 59, she died suddenly of a heart attack in a small flat in Frankfurt, while under strict guard by the Red Army occupation forces. She was buried in the Antique Temple of Sanssouci Park, Potsdam, in what would become East Germany. Some years earlier, it was the resting place of several other members of the Imperial family, including Wilhelm’s first wife, Augusta Victoria of Schleswig-Holstein. Putin is considering restoring the Russian Monarchy. Karl Scwarzenberg and I are kin to the Romanovs via Kaiser Wilhem. Since Nicholas and his family were sainted by the Russian Orthodox Church in Russia in 2000, churches, chapels and shrines dedicated to the so-called ‘Holy Imperial Martyrs’ have appeared across Russia. In conformity with Orthodox practice, icons (devotional images) of these sainted Romanovs are for sale in a variety of poses, from mass-produced laminated cards to lavish diptychs housed in soft red velvet cases. Their former palaces and places of exile and execution have become pilgrimage destinations. A hundred years next year since the 1917 revolution, public memory has turned full circle. Where Russians were once encouraged to repudiate the Romanovs as ‘oppressors of the people’, today they’re encouraged, quite literally, to worship them [Of course, we cannot agree with nor endorse this exaggeration—O.C. ].